Northeast America, ca. late 19th century. Vivid and fun and fresh. Unconventional form. 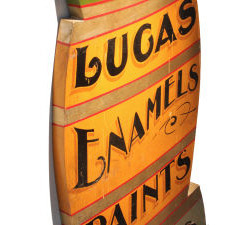 Original paint and over-varnish on hardwood in the form of three graduated, stacked paint-barrels with highly-stylized black lettering, with shadowing, on background colors of green, mustard, and blue, each wrapped with silver-cream bands and red trim. The colors wrap around the sides. The sign is double-sided, yet the back is more worn. A bracket on the top enables it to be easily hung. Its vertical format allows it to be positioned on a narrow wall. 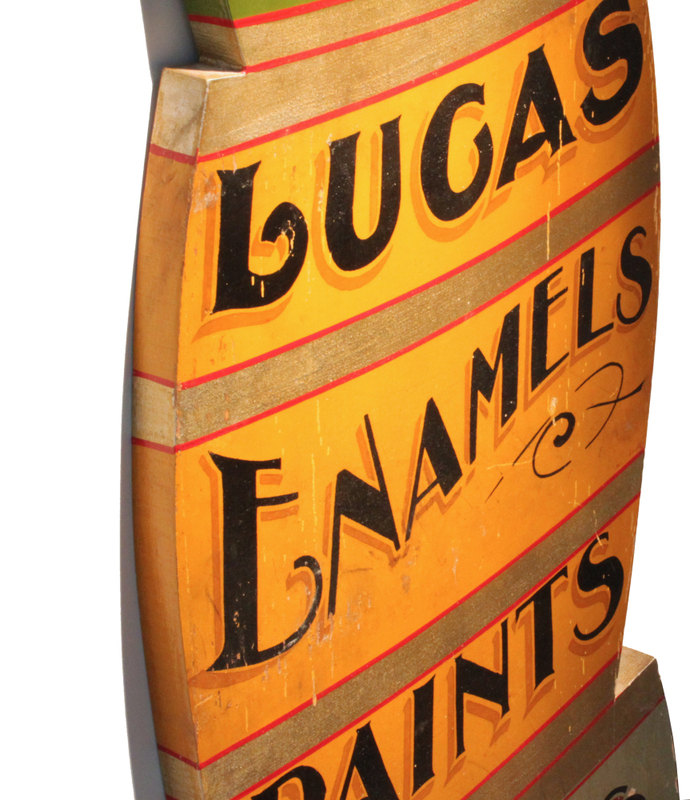 Included with the sign is its original pine shipping crate, bearing the stencil FROM/JOHN LUCAS & CO/PHILA, NEW YORK, CHICAGO…..The back story of John Lucas is very appealing. 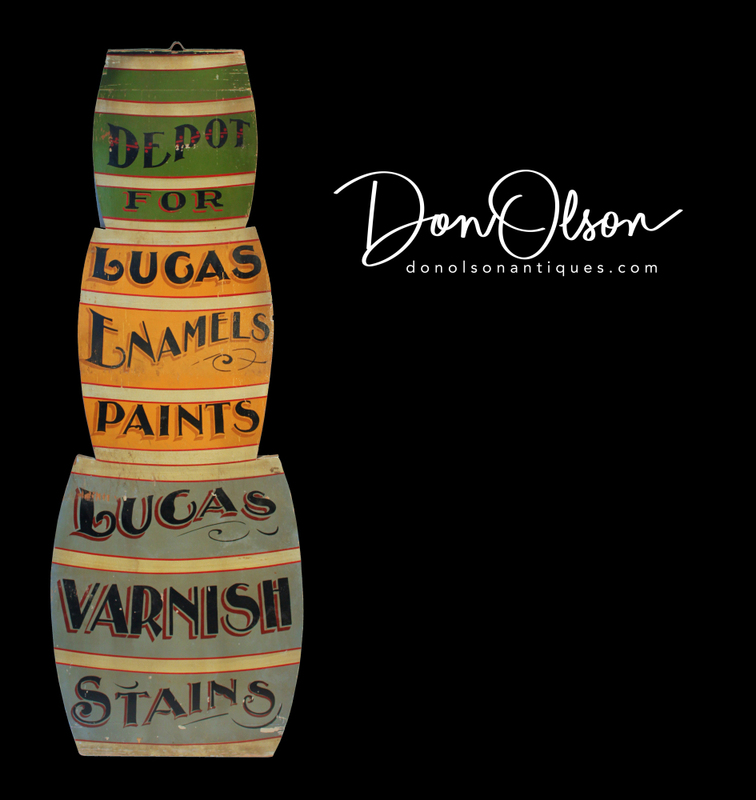 Originally a paint maker from England, he established his paint company in Gibbsboro, NJ in 1842 where he pioneered new ways to make paints. 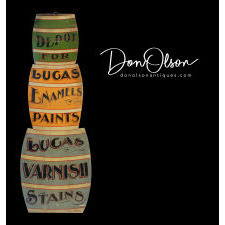 In the late 19th century he patented the first ready-to-use paint products, especially for colorful Victorian houses, and created new pigment colors that were also much more environmentally safe. His social conscience and financial success led him to being a noted Philanthropist, building Gibbsboro into a dynamic and thriving village. Superb structural condition with minor paint losses and abrasions. 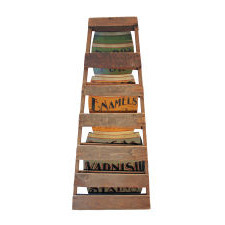 Maximum dimensions about 49 inches tall x 17 1/4 wide. 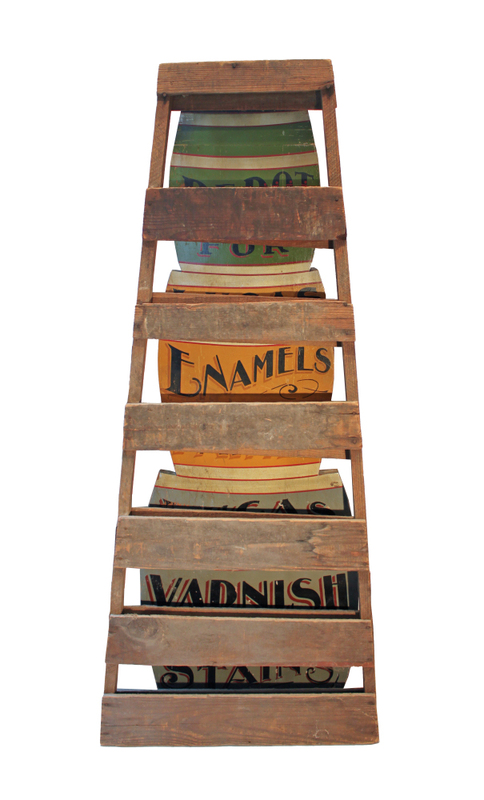 Provenance: Prominent Midwest collection..